Sales of traditional bathroom scales have plummeted, and it’s obvious why – body fat monitors have proven to be a far more effective way to measure body fat. The words “body fat” here are key, because a traditional scale will only tell you how much you weigh, not how much of your weight is fat. This is a crucial step forward where our health is concerned, because the weight is also comprised of bone and muscle, which you shouldn’t be losing. Another advantage offered by a body fat monitor is that such a device can help prevent obesity, which is a major global problem. Apart from resulting in depression and a decreased quality of life, obesity carries the risk of serious diseases like cancer, heart disease and diabetes. Without further ado, here is a comprehensive, yet concise review of the best body fat monitors on the market right now! The Skulpt Chisel is cheaper, lighter and has a longer lasting battery life than its predecessor Skulpt Aim. the Chisel is an easy-to-use body fat monitor that uses innovative zinc alloy sensors with nickel plating to take body fat measurements. How to use the Skulpt Chisel? Just spray the sensors with water and place the device on your muscle. There is a light ring around the edge of the device which lights up when the measurement is done. The results can be seen at once. How does the body fat monitoring of the Skulpt Chisel work? 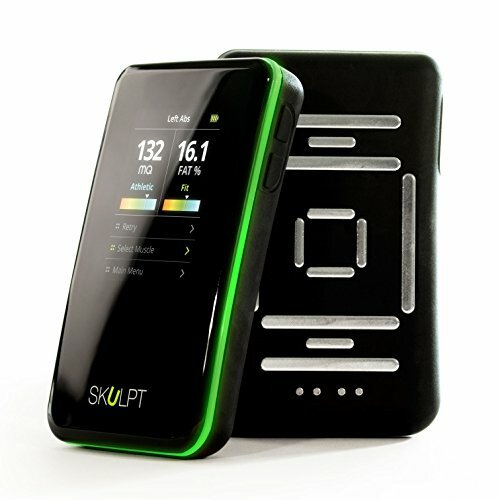 The Skulpt Chisel is based on Electrical Impedance Myography (EIM) technology, which means it will send a weak electric current through the muscle you want to measure. This is why it is inadvisable to use this device if you have a pacemaker or another electrical implant. At any rate, your values are arrived at by measuring the resistance of the muscle to the electric current. The device’s lithium-ion battery takes about 2 hours to charge and lasts a full month. Evidently, the device is water resistant, but not waterproof, so don’t shower or swim with it. The Chisel is compatible with iPhone 5 or newer versions and with Android OS 4.3 or newer versions. It functions optimally in the temperature range of 32 to 104 Fahrenheit. You measured values can occasionally vary depending on how hydrated you are and what your specific weight distribution is. Fitbit is well known for its popular fitness trackers Fitbit Charge and Fitbit Surge. 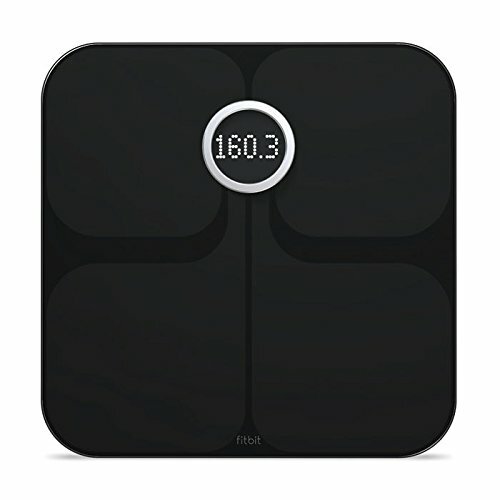 What first strikes you about the Fitbit Aria Wi-Fi Smart Scale is how sleek and elegant it looks. Its design is absolutely unique. Maybe you don’t think “bathroom scales” and “elegance” belong in one sentence and you’ve never even considered buying a bathroom scale. But we’re going to change your mind! How to use the Fitbit Aria? Like on any other standard scale, just step on it and start your measurements. Furthermore the Fitbit Aria is compatible with all the other Fitbit fitness tools. The scale records your weight, body fat percentage and body mass index. This data can be sent to the cloud for analysis and this knowledge will leave you feeling more fulfilled and motivated about getting fit and staying in shape. How does the body fat measurement of the Fitbit Aria work? The body fat measurement works with bioelectrical impedance principle (Bioelectrical impedance on Wikipedia). What is unique about the Fitbit Aria design? The scale is an absolute feast for the eyes. Its platform is made entirely out of glass. It comes in black or white, and the smoky surface is unimaginably elegant. The Aria is much lighter and of better build quality than other scales of its magnitude, and by magnitude we also mean its price of currently around $130. This is a lot for a scale, true, but again, it isn’t just any old scale. Its bottom is flat and stable, so that weight is distributed evenly. This is especially important if you want to know your actual weight and BMI, but your floors are uneven. The Aria body fat monitor is also really easy to install. 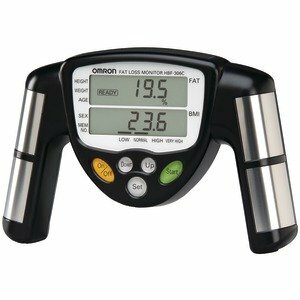 The Omron HBF-306C BodyLogic is a hand-held body fat monitor that measures your body fat percentage and BMI. Its portability is a major advantage and so is its very competitive price of $37.68. It saves data of up to eight people. This means you don’t have to re-enter your height, weight, gender and other data every time you retest. The Omron BodyLogic is a very useful device for people who are on a strict diet and want to keep track of their progress. The EatSmart Digital Body Fat Scale offers quick and easy monitoring of body fat, muscle mass, bone mass, body water and weight. It’s definitely a good deal with a price of currently around $49.95. It’s getting top reviews from people who are concerned about their health and are making active efforts to take control of it. How to use the EatSmart body fat analyzer? Before you obtain the measurements you need to enter your age, height, gender, weight and other basic data. Step on the scale and begin the measurement. As the scale can store multiple user profiles, it will recognize an individual the second he or she steps onto it. You’ll get a reading instantly on the huge 3.5″ blue LCD display with bright backlight. How does the body fat measurement of the EatSmart scale work? The EatSmart body fat monitor is also based on bioelectrical impedance analysis technology, which measures your stats by sending a low-level electrical signal though your body fat. The values are reached by measuring the resistance of the body fat to the electric signal. Rest assured that the current is safe. You might not even feel it. Again, don’t use it if you have a pacemaker or another electrical implant. What’s more, it’s one of the most stable scales out there – other scales will show deviations by up to a kilo depending on which room or even which part of the room you’re weighing yourself in if your floors are uneven. EatSmart is rock solid. The scale uses 4 AAA batteries. [2016 VERSION] - Updated EatSmart Auto-On Technology and Sensor Accuracy. 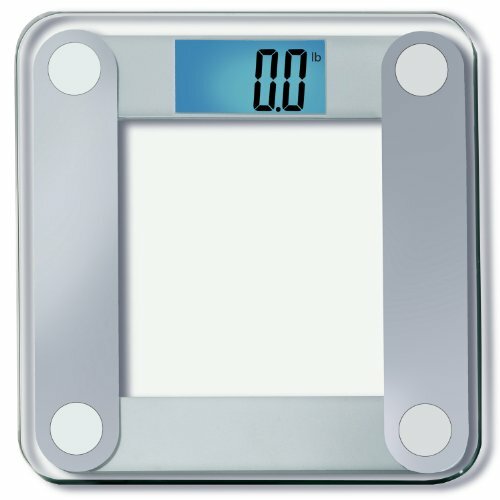 Best selling scale on Amazon 7 years running. Best in class customer service and support from a trusted vendor! Large 3.5" LCD display w/ Accubright blue backlight - Easy to read from any distance or angle! How to use the GoWise USA body fat scale? 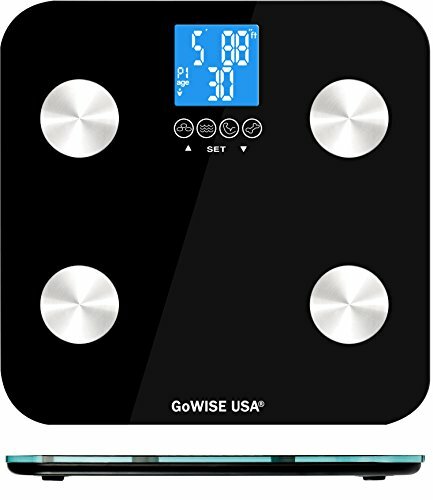 The GoWise USA body fat digital bathroom scale also measures bone mass, water and muscle mass. It’s the perfect choice for everyone who wants to maintain the proper weight and is serious about taking control of his or her health. It can save up to eight user profiles, and even features an athlete mode for people who have a heart rate of 60 beats per minute and do over ten hours of heavy exercise a week. How does the body fat measurement of the GoWise scale work? The scale uses EIM technology to calculate your values. What is unique about design of the GoWise scale? It has a lot going for it where design is concerned, with a tempered glass platform and elegant sensors. Other features include automatic switch-on, touch switch, and LCD backlight. It can measure up to 396 lb and 86 inches. The scale is explicitly not suitable for users under 18 due to the rapid changes in weight and height typical in adolescence. The scale is quite a good deal at $30. The InBody Band is a wristband tracker that measures your body fat percentage and heart rate via bioelectrical impedance analysis. The InBody body fat monitor is comfortable, easy to wear, and can be combined with straps of different colours. The measurements are quick and accurate. On the downside, its display can be hard to see if there is bright light. With a current price about $180 it is one of the rather expensive devices. Measure your body fat and muscle mass anytime, anywhere. Get the most out of your workout. Check the intensity of your workout by monitoring your heart rate. Measure your movement to calculate number of steps, distance, active time, and calories burned. Automatically monitor how long and how well you sleep. Set a silent alarm to wake up peacefully. 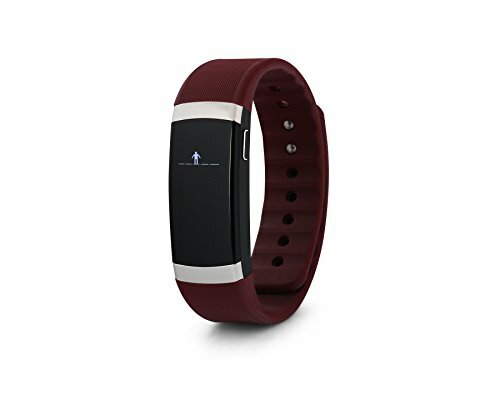 The InBodyBAND vibrates to notify you of any incoming calls and texts (Compatible with Android 4.3 with BLE or newer and iPhone 4S/iOS7.0 or newer). We hope you’ve found this article interesting and informative and are now better-oriented when it comes to shopping for a body fat monitor. Go and get what’s best for you! As you can see, you will be able to choose from conventional-style scales, wristband trackers and hand-held devices. There is a wide range of opportunities out there – go and get what’s best for you!